a great favourite of the Glasgow athletics public in 1910. The Rangers Sports at the start of 1910 were on a high after the efforts of William Wilton and his committee which had brought an international dimension to an event which in 1900 had been almost entirely a Scottish affair (with some English guests). It had also been slightly in the shade of the Celtic Sports, held a week later, organised by William Maley who always went out of his way to attract top athletes and introduce novelty attractions meant to draw in the crowds. By 1910, the two events were to some extent complementary with athletes often staying over from the Rangers meeting to compete at Parkhead, or some of those enticed to Celtic Park coming a week early and competing at the Rangers Monday meeting. This ten year period in the development of the sports saw them become really international over the first four years of the period before the War brought them back to a purely local event with the five-a-side competitions being developed to fill out the programme and bring in the crowds. The club – like most others – donated money to the War Effort throughout the period and the sports often held events confined to serving soldiers and sailors. 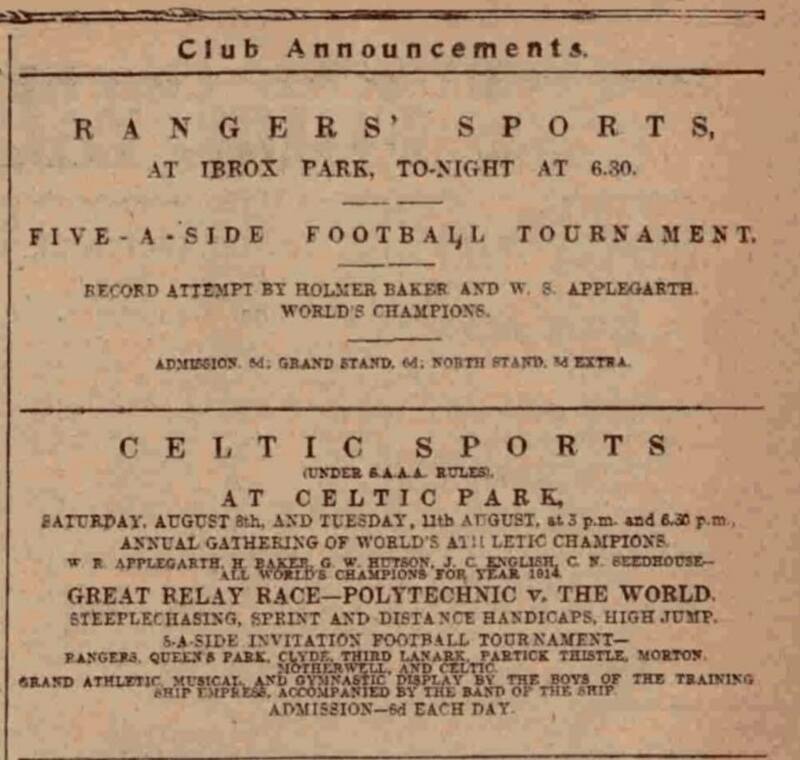 The first Rangers Sports of the decade was reported in the ‘Glasgow Herald’ on 8th August. There were two heats of the 100 yards invitation handicap and the runners included Reginald Walker from South Africa on scratch. He duly won the first heat from RC Duncan (West of Scotland Harriers – 3 yards) and A Law (Bellahouston Harriers off 7 yards) and the race was reported as “The Colonial just caught Duncan in the last stride and won by a breast.” The second heat was won by R Kitson (West of Scotland – 6 yards) from FL Ramsdell (Pennsylvania – scratch) and LJ deB Reed (South London Harriers – 2.5 yards). The final was won by Duncan from Walker and Ramsdell the report reading “All were despatched in a perfectly orderly start, Duncan passed those in front at 75 yards and though Walker and Ramsdell put in a punishing finish they could not get on even terms with the Scottish champion. It was a very fine thing however, a couple of feet covering the first four while Reed and Law were both in the picture at the post. Winning time:- 10 seconds.” For a Scot off 3 yards to defeat an Olympic champion and a an American over 100 yards must have been a source of great pride to the organisers and is a mark of the quality of Scottish running at the time. The reporter also commented that in conditions such as those prevailing at Ibrox on that Saturday, Walker was incomparable. Reed went on to win the special invitation 440 yards in 50.6 – “his methods were those of a runner who has given intelligent thought and study to the requirements (brain and pace) for such a distance” – from Hepburn (West of Scotland – 17 yards) and George Dallas (Maryhill – 13 yards). Emphasising the international nature of the meeting, H Inglis of Pretoria was the scratch man in the hurdles race where he finished third having conceded 10 yards to the winner and and four yards to the Welshman who was second. A South African and an American in the 100 yards, an Englishman in the 440 yards and a Welshman and another South African in the hurdles. In the half-mile, E Owens from Broughton Harriers in England (scratch) was the favourite but could only finish second to McDougall of West of Scotland (40 yards) who won in 1:59.6 with A McPhee of Clydesdale Harriers (15 yards) third. In the mile, McGoughoff 60 yards was second to Stoddart of the West of Scotland who was off 105 yards and won in 4:19.2. For the record, the 9000 crowd who turned up to see the meeting saw Falkirk, St Mirren, Clyde, Partick Thistle, Rangers, Celtic, Queen’s Park and Third Lanark compete with Rangers winning the final against Third Lanark 3–1. The 100 yards was won by JA Coyle St Andrew,s despite the presence of Walker and Ramsdell, and the 220 was won by JC Cockburn of Gala Harriers. There were some disappointing performances at the Sports on the Saturday but the international dimension was further developed. One of the stars barely mentioned in the preview was HE Gissing from New York – he ran for the New York TC whose emblem was a winged foot which seems appropriate for an athletic club, but he also ran for the Irish American Athletic Club team that set the first IAAF- recognised world 4 x 440 yards record of 3:18.8, and their emblem was a winged fist. Running for the NYTC relay teams he often ‘turned defeat into victory’. More relevant to the Ibrox meeting, in 1908 he had won the AAU half-mile championship in 1:56.8 and went on to win the AAU 1000 yards championship three years running (1908, ’09, ’10) and in 1909 was second in the National AAU Championships. 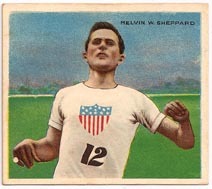 Incidentally, another member of the Irish American AC which set the 4 x 440 record was Mel Sheppard who is mentioned below. The report on the meeting read: “No fewer than 10,000 witnessed the sports at Ibrox Park on Saturday afternoon. Fortunately the rain held off during the proceedings though before and after there were smart showers. The programme was more varied than usual, there being boxing and five-a-side football, in addition to the orthodox pedestrian handicaps. The racing was keen throughout and and the finishes in many cases could not have been any closer. FL Ramsdell, the AAA sprint champion, just beat AE Hunter (Edinburgh University AC) by inches in the invitation 100 yards handicap, while in the final of the furlong handicap G Sandilands (Edinburgh Harriers) was not more than a foot in front of TC Wright, another prominent East of Scotland runner. But perhaps the finest performance of the proceedings was HE Gissing’s 1 min 56 1-5th in the invitation half-mile. This is only a fifth of a second worse than Melvin Sheppard’s all-comers record at the Rangers Sports in 1908. Had Gissing not eased up in the last ten yards he might have created a new record. As it was, he ran a memorable race and those who saw it are not likely soon to forget the easy way in which he travelled. JT Soutter of Aberdeen University AC was scratch with the American but the SAAA half-mile champion was obviously not at his best by any means. He was the last to finish which is a novel experience for him. Soutter has given up running for a season. He has achieved several fine performances although we understand that he is a little disappointed at his failure at Ibrox on Saturday, which is not to be wondered at, as he had set his heart on accomplishing something in keeping with his reputation as a half-miler. DF McNicol again demonstrated his marvellous consistence as a runner. He was second in the invitation half-mile in 1 min 58 1-5th sec off 10 yards; in the open half-mile he won the first heat in 1 min 58 3-5th sec and the final in 1 min 58 sec. The mile fell short of expectation. E Owen, an ex-AAA champion, was scratch, and the fact that he did not finish in 4 min 26 3-5th sec clearly shows that he was not in running humour. Owen may have taken too much out of himself in the invitation half-mile, but even that can scarcely account for his indifferent display, especially in the light of the great work accomplished by McNicol during the afternoon. The winner was J McFarlane, Glasgow University AC, whose success was well received. If we mistake not, McFarlane was the winner of the Celtic mile last year. He ran with judgement and finished strongly, though the time was well within the reach of the scratch man. The 100 yards confined to those with 5 yards and upwards of the Scottish champion was quite interesting, and it is noteworthy to mention that the final was won in the same time that Ramsdell accomplished in the special handicap, thus showing that the concessions in the one as in the other were in favour of the American crack. …. The meeting also had a 120 yards, a 300 yards and a mile-and-a-half with good competition but the 1000 yards was the only real stand-out race, with Clyde FC winning the football tournament. James Tindal Soutter from Aberdeen University, who was mentioned above is one of the most interesting athletes in Scottish middle distance running history. Soutter was born in the Church of Scotland Manse in Echt, Aberdeenshire, on 1st January, 1885 and had been a pupil at Aberdeen Grammar School who went on to become an apprentice engineer. Deciding to become a minister he went to Aberdeen University where he graduated MA in 1910. This was hen the former rugby player made up his mind to concentrate on athletics. * in the AAA’s championships he was second in his Heat to the Canadian Mel Brook in 1:57.4 after leading through 440 in 54.2, an amazing split. In 1911 he was timed at 1:56.4 for the 880 yards leg of the AAA’s mile medley relay while running for Blackheath. 1912 was possibly his very best year though. In May he won the Olympic 400 metres trial at Celtic Park in 52.0. Then in June at St Andrews in the Inter-Varsity Sports he won 220 (22.8), 440 (53.6) and 880 (2:03.6) before winning both 440 (51.8) and 880 (2:01.8 at the SAAA Championships. In London only one weel later he was second to the very good German Hans Braun in the 880y in 1:58.2. This all earned him selection for the Olympic Games at Stockholm in the 400, the 800 and the 4 x 400. Running well up to his standard, he qualified for the second round of the 400m but was second in the second round behind Braun. In the 800m he won the seventh heat in 2:00.4 in front of Mel Sheppard (USA) but refused to run in the second round because it was run on a Sunday. It should be remembered that at this time he was a Presbyterian Divinity student. It was in the 4 x 400m though that he won his Olympic medal. The squad won its heat in an Olympic record time but Soutter was injured for the final and although he did his best the team finished third. In 1913 he gave up track and field for missionary work and travelled to Africa. He came back and joined up for the First World War and also served in the Second World War in the Radio Intelligence base in East Lothian where he did a variety of jobs including such things as making dead letter drops using their base in Smeaton House. Thereafter he went back to being a minister in Aberdeenshire. And then in 1959, he simply disappeared and was never found again. After seven years he was presumed dead. He had simply disappeared. A wonderful, if short-lived, athletics career, a dramatic life, the refusal to run on the Sabbath predated Eric Liddell by 12 years, and his whole dramatic life might have made a better than average film. 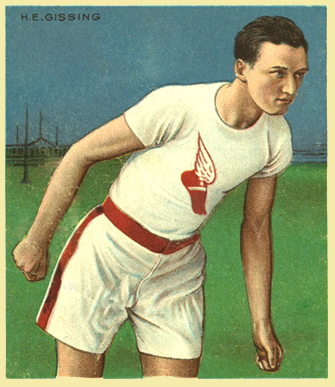 There were several outstanding athletes competing at the Rangers Sports of 1912. It was of course an Olympic year (Stockholm) and athletes had been in Europe for the Games and several were available for local meetings. One was Don Lippincott from Philadelphia who had competed for the USA in the 100 yards where he finished third in the 100 metres and second in the 200 metres. A high quality athlete, he was also the first 100m record holder recognised by the IAAF with a time of 10.6 and he also held the 100 yards record with 9.6 seconds. But big a name as he might have been, the star man had to be Hannes Kohlemainen of Finland. He had won three gold and one silver medal at the Olympic Games that year – gold in the 5000m, 10000m and individual cross-country with the silver being for the team cross-country. Two men, five Olympic medals! He also lived in the USA for a number of years and wore the Winged Fist of the Irish American AC. Among the other Olympians there were Mel Sheppard of America, H Braun of Germany and JE Meredith, also America and world class at all distances between 440 yards and the Mile. as well as English and Irish athletes. There were 14 heats of the open 100 yards and Duncan McPhee of Clydesdale Harriers won the half-mile which his brother Alex had taken a year earlier. A year later McPhee would be racing in the West of Scotland colours. Applegarth was back on 1st August, 1914, and the international element was supplied by Homer Baker who was the American half-mile champion in 1913 and 1914 and took the AAA’s title from AV Hill in 1914 when touring Europe. The Saturday meeting was reported as follows. “Fully 15,000 persons attended the annual sports of the Rangers Football Club which were held at Ibrox Park, Glasgow, in beautiful weather. As on previous occasions the club were favoured with the entries of several prominent English and Irish athletes, and a feature of the meeting was the performance of TJ Carroll of the Royal Irish Constabulary who in the high jump handicap made a successful attempt on the Scottish all-comers record. TRhe previous best jump was that of SR Jones at Ayr in 1908, the height being 6′ 1.25”. Carroll on Saturday improved on these figures, clearing 6′ 2.5″ for which he was loudly cheered by the spectators. 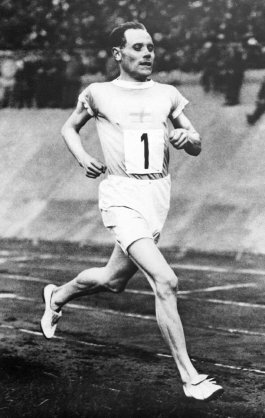 In the sprints the outstanding figure was WR Applegarth, the English and International champion at 100 and 220 yards. Applegarth was beaten in the heat of the 100 yards special handicap by his clubmate WC Bluck, to whom he was conceding 6 yards, and in the final of the 220 yards special handicap he had to be content with second place, another Polytechnic man, J Rooney, being a yard in front at the tape. Rooney’s time, 21 2-5th sec, equals the Scottish all-comers record, established by Applegarth at a recent international meeting. The champion however, was seen at his best in the relay race, West of Scotland Harriers v Polytechnic Harriers. The Scottish team were allowed 10 sec start, and it may be said that Polytechnic’s victory was due to Applegarth’s brilliant running in one of the furlongs. Homer Baker of New York was unplaced in the half-mile which was won by Lindsay of Edinburgh off 51 yards. He put this right though on the very poorly attended supplementary meeting on Monday, 3rd..
Baker’s time (which had to be found by working through the list of results) was 2 min 16 2-5th sec for the 1000 yards distance. For all the weather was criticised, the standard of competition and the calibre of athlete on display were high. The 100 yards was won by J Cattanach of Edinburgh University (10 yards) who beat Applegarth in the first heat and won the final; the 220 yards was won by Applegarth (scr) from Rooney (4) and Bluck (11) in 22 4-5th sec; the One Mile Handicap was won by AV Hill (10 yards) from Duncan McPhee (20 yards) in 4: 25 3-5th; and the 1000 yards was won by Baker from Sam S Watt (Clydesdale Harriers – 39 yards) in 2 min16 2-5th sec. In the five-a-sides, Celtic (2 goals, 1 corner) beat Rangers (2 goals). If football was the big draw in 1916, it seemed to pall a bit the following year. The report from the ‘Glasgow Herald’ of 6th August read: “Without equivocation it is safe to describe Rangers latest sports venture as the most successful to this stage of a comparatively crowded season. The general setting was perfect, the weather conditions were ideal, and the crowd was numerous and enthusiastic. The programme was a discriminating blend of novel contest and serious competition, and not even the least important event on it failed to arouse interest. Such criticism as could be urged against it must be limited to the suggestion that football occupied more than a just proportion of time, and the rather lengthy tournament tended to lose attractiveness in its later stages, when the spectators appeared satiated with the endlessness of the ties. On the other hand, the flat events were sources of ever-recurring excitement, and from this it will at once become apparent that the fields were never attenuated and that the finishes were invariably thrilling. No doubt the prestige of the promoting club accounted for the first feature, and the handicapping of Mr Livingstone and the obvious keenness of the competitors were responsible for the second. From the sprint to the Mile, every race was determined by a measurement calculated in inches and nothing finer has been seen than the dash by Weir which caught Ross in the half-mile, the subtle judgment which gave McFadden a victory in the furlong, and the magnificent effort which enabled Ross to register a double win and shake off Wilson’s challenge in the Mile. In the last mentioned event it is noteworthy that the placings corresponded exactly with the numbers of the competitors in the programme. The teams in the football tournament were Rangers, Celtic, Partick Thistle, Clyde, St Mirren, Queen’s Park, Third Lanark and The Military Five, the last named won the competition (with a team of Breville, Waddell, Duncan, Walker and Fletcher), over Rangers (Blair, Bowie, Dunn, Brown and Lawson), the score being one goal to one corner. On the same day, the National Projectile Factory held a sports at Celtic Park (before a crowd of 10,000) with the proceeds going to the Princess Louise Hospital for Limbless Sailors and Soldiers,the Ypres Projectile Factory held a sports at Moorroft Park, Renfrew in aid of Limbless Sailors and Soldiers Fund, and a meeting at Cappielow Park, Greenock before 5000 spectators in aid of the Red Cross Fund. Lots of choice for the athletes, entertainment for the spectators without too much travelling involved. ‘The Glasgow Herald’ August 5th, 1918: The loyalty of the Rangers following has frequently been the subject of comment and whatever direction the activities of the club may take support is assured. On Saturday a magnificent crowd of the faithful was present at Ibrox on the occasion of the annual sports meeting. The programme contained not a few novelties and if, on the purely athletic side, it did not and could not be expected to reach the pre-war standard it sufficed to attract and give pleasure to the large concourse. To those interested in the more scientific aspects of athletic competition, the handicapping was perhaps the chief feature, for Mr Livingston, in adapting the the appropriate champion as the basis for allocation, departed from the practice which Mr Copland has made familiar in the current season. In all mathematical problems – and handicapping is largely a matter of mathematics – consistency and uniformity can only be attained by reference to a fixed standard, and theoretically Mr Livingston’s method would appear to be the sounder. For most people, however, the result and not the means of reaching it is the prime test of efficiency, and it would not be unfair to say that Mr Copland’s calculations have generally culminated in keen sport and thrilling finishes. Saturday’s meeting was rather lacking in intensity and distinction largely because of the obliteration of the back markers. The hundred and the furlong were the most interesting events and in the final of the latter Bollini ran with greater verve than on his recent appearances. Ross seemed likely to be placed in the half mile, but the task of wending his tortuous way through a large field deprived him of the dash necessary for a successful finish, and to the chagrin of the crowd was unable to obtrude himself into the prize list. Malcolm ran well in this item and also in the mile but succeeded in obtaining recognition only in the shorter race. The 20,000 spectators saw only five events (plus heats) with the five-a-side being won by Celtic 2 – 0 over Rangers. 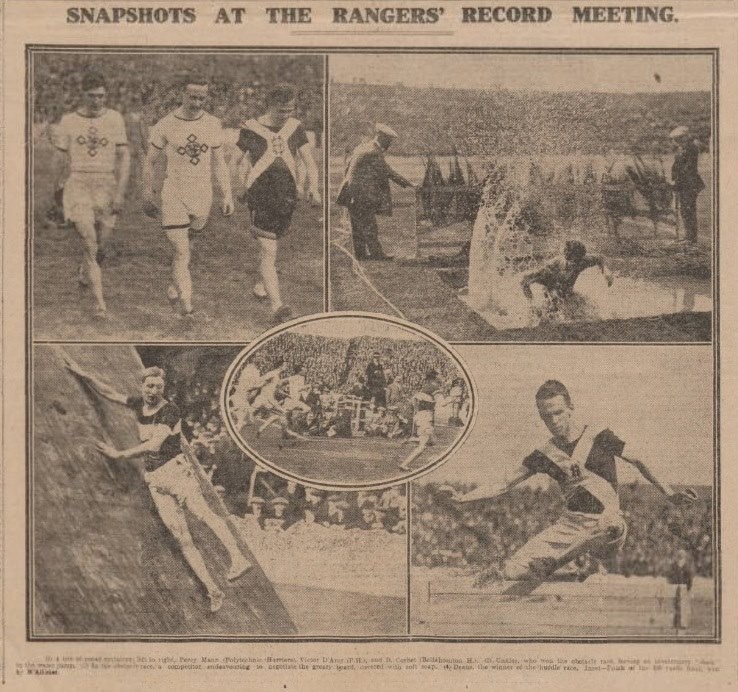 The Rangers Sports of 1919 were back in the business of top runners from outside Scotland being invited to compete and an extended programme being offered to the Glaswegian sporting public. 20,000 was the estimated attendance. The highest quality events were the middle distance races where AB Hill, the English 880 and Mile champion was opposed not only by the well handicapped Scots but also by New Zealand’s Sergeant Mason. Hill, giving Mason eight yards beat him from scratch in 1:57.8, while neither of the best Scots (G Dallas and S Small) made the final. Neither Hill nor Mason ran in the mile handicap which was won by WB Ross in 4:23.4 and the sprints were both won by Eglinton Harrier AH Graham. The war was over, the sports were starting to build up again into the international event that they had been before 1914.